WASHINGTON (Reuters) - Arctic sea ice shrank to its second-lowest level ever, U.S. scientists said on Wednesday, with particular melting in the Chukchi Sea, where polar bears were recently seen swimming far off the Alaskan coast. This year's Arctic ice melt could surpass the extraordinary 2007 record low in the coming weeks. Last year's minimum ice level was reached on September 16, according to the National Snow and Ice Data Center. Even if no records are broken this year, the downward trend in summer sea ice in the Arctic continues, the Colorado-based center said. Last year's record was blamed squarely on human-spurred climate change. "No matter where we stand at the end of the melt season it's just reinforcing this notion that Arctic ice is in its death spiral," said Mark Serreze, a scientist at the center. 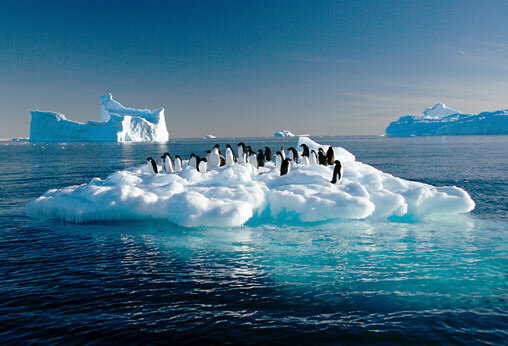 The Arctic could be free of summer ice by 2030, Serreze said by telephone. This year's data "primarily reflects melt in the Chukchi Sea off the Alaskan coast and the East Siberian Seas off the coast of eastern Russia," the center said. The Chukchi Sea is home to one of the world's largest polar bear populations and also includes a vast area where the United States sold oil and gas rights worth $2.66 billion last year. On Tuesday, Arctic sea ice stretched over 2.03 million square miles, which is less than the 2005 mark of 2.05 million square miles, set on September 21 of that year, the center's analysis found. The record drop in 2007 left a minimum ice cover of 1.59 million square miles. The fabled Northwest Passage was open for the first time in memory. Government scientists reported seeing at least nine polar bears swimming in open water over a six-hour period on August 16, including one more than 50 miles offshore, World Wildlife Fund officials said. That represents a huge increase over previous sightings, said Margaret Williams of the fund's Alaska office. 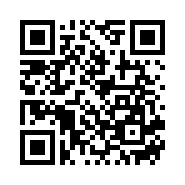 A total of 12 polar bears were spotted in open water between 1987 and 2003, Williams said in a telephone interview. In 2004, she said, four drowned bears were observed. "Unfortunately it's what we might expect to see if bears are forced to swim longer distances," Williams said. "The Arctic is gigantic. When you have nine bears sighted in one transect (route) ... one can assume that there are likely a lot more bears swimming in open water." 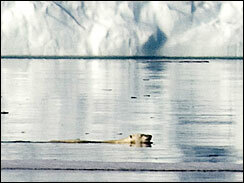 She noted that bears are capable swimmers and rely on sea ice as platforms for hunting seals, their main prey. If relegated to land, bears have little to hunt and sometimes feed on carrion or garbage and can be a threat to humans. As more Arctic ice melts, bears are forced to swim longer distances to find adequate platforms for hunting. Rescuing bears in distress in open water is problematic, Williams said: tranquilizing the bears sends them into the water to drown. The U.S. government in May listed polar bears as a threatened species because their icy habitat was disappearing, but offered no plans to address climate change or drilling in the Arctic for fossil fuels that spur the climate-warming greenhouse effect. Summer ice melt in the Arctic is seen as a strong indicator of climate change, and feeds on itself in what scientists call a positive feedback loop where warming exposes dark sea water, which absorbs more solar radiation than the white ice. Arctic sea ice is sometimes dubbed Earth's air conditioner for its ability to moderate world climate. In the last decade, this ice has declined by roughly 10 percent. 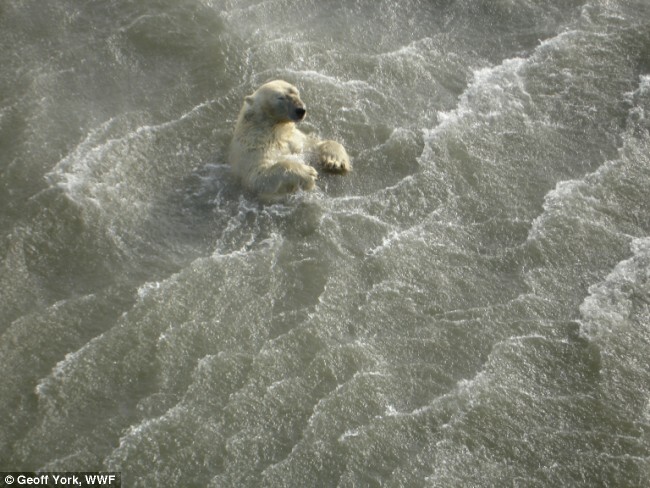 Struggling against the waves, this polar bear faces almost certain death after becoming lost at sea in the Arctic. It is one of a group of nine to have plunged into the ocean after the ice float they lived on melted. The bears were spotted miles from their normal hunting ground by U.S. government oil survey scientists flying over Alaska's Chukchi Sea. They said the creatures' homing instinct has sent them north towards the edge of the polar cap instead of 60 miles south towards the nearest land. However, because of global warming, the ice cap has melted so much that it is around 400 miles away - too far for the bears to reach. Although one group of polar bears is known to have swum 100 miles, they arrived at their destination exhausted, with several drowning along the way. Animal charity, the World Wide Fund for Nature, said it was considering asking the U.S. government to send a ship, like a modern Noah’s Ark, to rescue some of the bears. Yesterday, researchers also warned they feared the annual ice-melt has passed its 'tipping point', where not enough freezes each winter to make up for the previous summer's melt. Senior scientist Dr Mark Serreze said: ‘The summer melting used to slow down by the beginning of September. Experts with WWF, the World Wide Fund for Nature, fear the bears can’t make it. Polar bears are strong swimmers but would not be able to make it that far. In May, the US Department of the Interior listed polar bears as threatened under the Endangered Species Act because the Arctic ice they hunt on is melting so quickly. The Chukchi Sea off Alaska’s northwest coast is home to one of two populations of Alaska polar bears. Scientists studying global warming in the Artic revealed some dreary news last week about melting sea ice. Researchers from the National Snow and Ice Data Center found sea ice covers just more than 2 million square miles of the region, the second-lowest level recorded in the nearly 30 years of satellite measuring. The lowest level recorded occurred last September. But with a few weeks left in the Artic summer, experts predict this year’s sea ice could plunge to an all-time low. NASA scientist Jay Zwally told the Associated Press that within a decade the region could be completely free of sea ice during summertime. Already hit hard by the melt is the Chukchi Sea, near Alaska, home to Alaskan polar bears. During a recent survey in the area, several bears were spotted up to 65 miles from shore. They likely were trying to reach polar ice some 400 miles away, though the longest recorded swim by a polar bear is 100 miles. 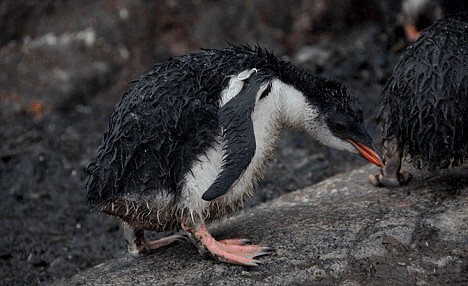 Tens of thousands of newly-born penguins are freezing to death as Antarctica is lashed by freak rain storms. Scientists believe the numbers of Adelie penguins may have fallen by as much as 80 per cent – and, if the downpours continue, the species will be extinct within ten years. And the Emperor penguin – made famous in the Oscar-winning documentary March Of The Penguins – is also under threat. Temperatures on the Antarctic peninsula have risen by 3C over the past 50 years to an average of -14.7C and rain is now far more common than snow. 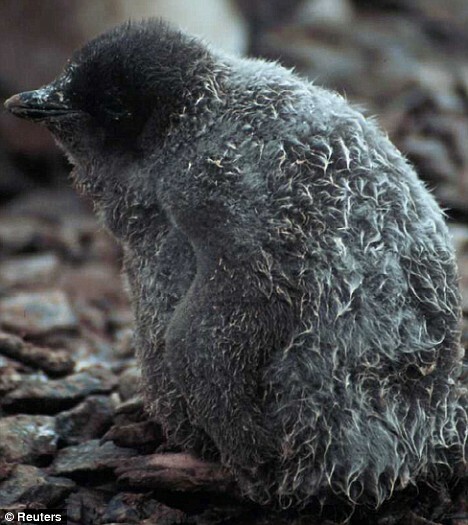 Adelie penguins are born with a thin covering of down and it takes 40 days for them to grow protective water-repellent feathers. 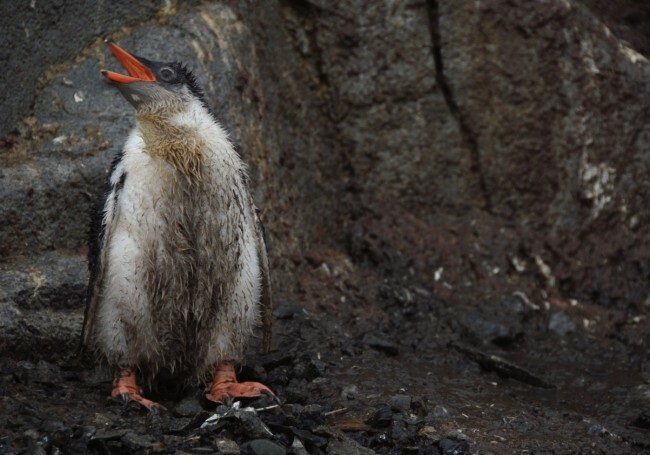 With epic rains drenching their ancestral nesting grounds, their parents try to protect them. But when the adults leave to fish for food, or are killed by predators such as seals, the babies become soaked to the skin and die from hypothermia. ‘Everyone talks about the melting of the glaciers but having day after day of rain in Antarctica is a totally new phenomenon. As a result, penguins are literally freezing to death,’ said Jon Bowermaster, a New York-based explorer who has recently returned from Antarctica. 2010: Cirque du soleil'S quidam-- Clowns!